THOUSANDS OF TEENAGERS across Ireland are sitting their Leaving Cert and Junior Cert this week. In the midst of all the young students taking the exams is 73-year-old Denis North. Denis left education after completing the Intermediate Cert in 1960, when he was just 16 years old. A breakup in his family left him with no choice but to go out and get work to earn money. He worked for nearly 48 years in a finance company before receiving his pension at the age of 63. With a lack of confidence in getting new employment, Denis decided to return to education “to get involved with something instead of sitting around scratching [his] head”. Since then, Denis has completed the History and Maths Leaving Cert papers and is sitting the English and Geography exams this year. He has been suffering from serious health issues since 2014 but that hasn’t stopped him pursuing his educational goals. In 2014, the Vocational Training Opportunities Scheme (VTOS) caught his eye and he spent two years learning about computers, communications, cultural and history classes with the scheme in Wexford. Nearing the end of his two years, an opportunity arose for Denis to go on to complete a Post Leaving Cert (PLC) course at Kennedy College, New Ross. The school offers both second level education and PLC education. “I was looking at all the young fellas in the school and I spoke to the principal, Suzanne Barrett, about their PLC course and asked if they could facilitate me and they were all for it,” Denis said. 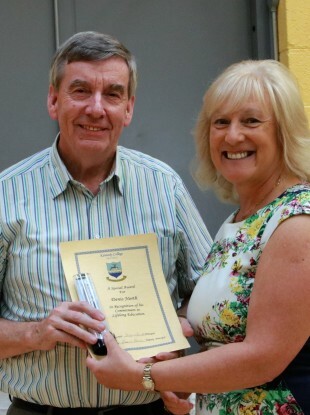 He went on and completed two PLC courses at Kennedy College and during this time he decided to tackle the Leaving Cert. I got a bit of a crack notion one day, not having had the opportunity to do the Leaving Cert before, that I’d like to do it. In 2014, Denis studied the Leaving Cert maths curriculum independently from the school, while doing one of the PLC courses in the school, and went on to complete the exam. The following year, he did the same with history. Last year however, after a suggestion from principal Barrett, Denis made the decision to go into 5th year and begin the two-year Geography and English curriculum, along with the school’s students. “I had no problem integrating at all because I did youth work for years and years in the 13 to 18 age bracket. I had no problem with them and nor they with me,” Denis said. If this year goes well and if my health improves, I would hope to go back next year and definitely do Irish and maybe something else with it. Looking back at the school setting in the 1950s, Denis said that it’s a lot easier for students to learn in today’s world because the education system has widened out. “The big difference I see is there’s so much available now by way of technology, there’s so much available by way of textbooks. Textbooks were scarce when I was going to school,” he said. Throughout his three years studying Leaving Cert curriculum, Denis has had massive health problems. In 2014, he suffered a “very serious” aortic aneurysm which required an operation but he still went on to complete his exams. “If you set your mind on something you just get on with it,” he said. I don’t see this as a big achievement. I just see it as there’s no age limit on education. Denis stressed that any adult with an inkling to go back into education should do so. “Take your courage in your hands and have a go at it. The worst that can happen is you’ll pull out of it. I’m not in it to be struggling to get points. I just want to do it and be the best I can with it,” he said. Denis completed English Paper One and Two on Wednesday and took the Geography exam on Friday. Email “This 73-year-old student is doing the Leaving Cert this week”. Feedback on “This 73-year-old student is doing the Leaving Cert this week”.